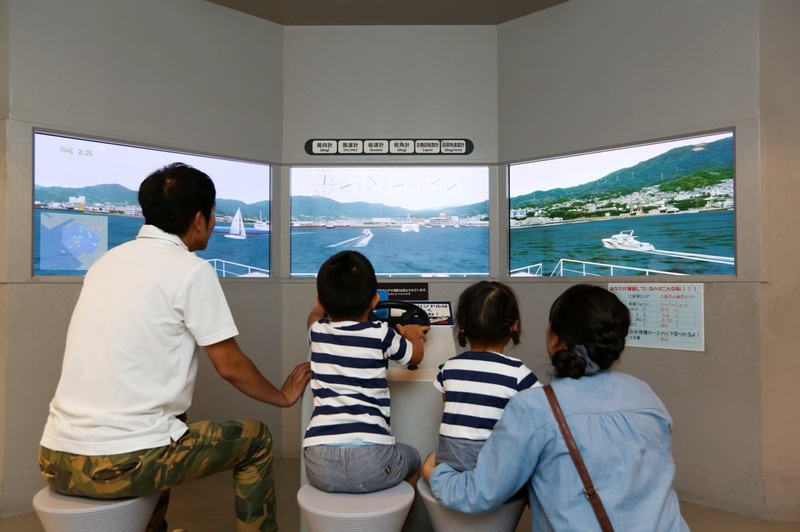 The Yamato Museum is the more popular name for the Kure Maritime Museum ( 呉市海事歴史科学館 Kure Kaiji Rekishi Kagakukan ) in Kure City, Hiroshima Prefecture, Japan. It is the World War II Imperial Japanese Navy super battleship IJN Yamato that the museum got its name from. And by the name of God, who hasn't heard of the Yamato! After a stopover at Hiroshima City where I visited the Peace Memorial Park with the iconic Genbaku Dome on 8th June 2016, I proceeded to the nearby port city of Kure the next morning where two naval attractions awaited, the Yamato Museum and the Japan Maritime Self Defense Force Kure Museum. 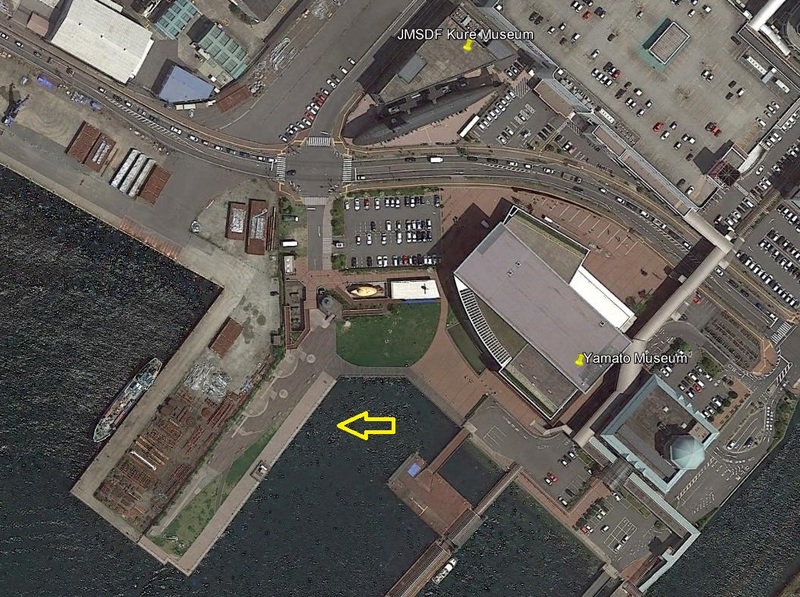 They were located at the wharf area adjacent to each other. As Kure was barely 26km away from Hiroshima, it only took 34 minutes and ¥500 ( USD 5.00 ) by rapid train service to get there. At Kure Station, prominent signs indicated the directions to the naval museums. Visitors would have to walk another 5 to 10 minutes along an elevated covered walkway that linked the station to the museums. The pillars of the walkway were adorned with banners commemorating the 10 millionth visitor to the Yamato Museum last year, exactly ten years after the museum opened its doors. 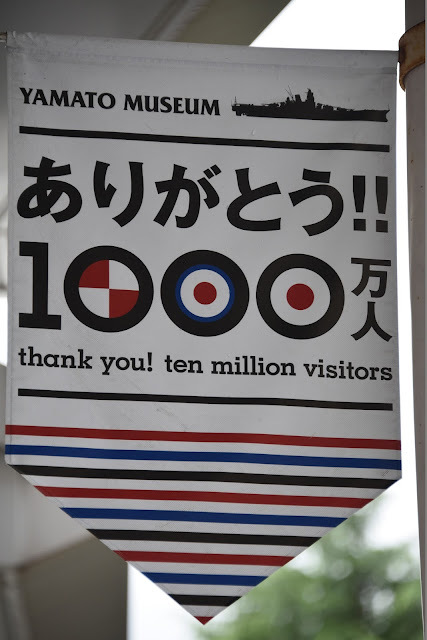 It had by May 2016 surpassed the 11 million visitor mark. So you must be wondering, what is the relationship between Kure and the IJN Yamato? Unless stated otherwise, all photographs taken by the author. 11 million visitors milestone achieved by May 2016. Source : Kure Maritime Museum. 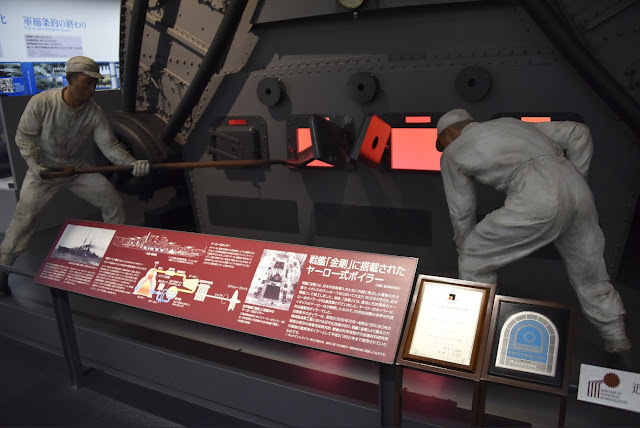 The modern history of Kure is deeply intertwined with the Imperial Japanese Navy. It really started in 1870, two years after the Meiji Restoration, with the formation of the modern Japanese Navy. Because of its strategic location within the Seto Inland Sea, the Navy chose Kure to set up a major base. 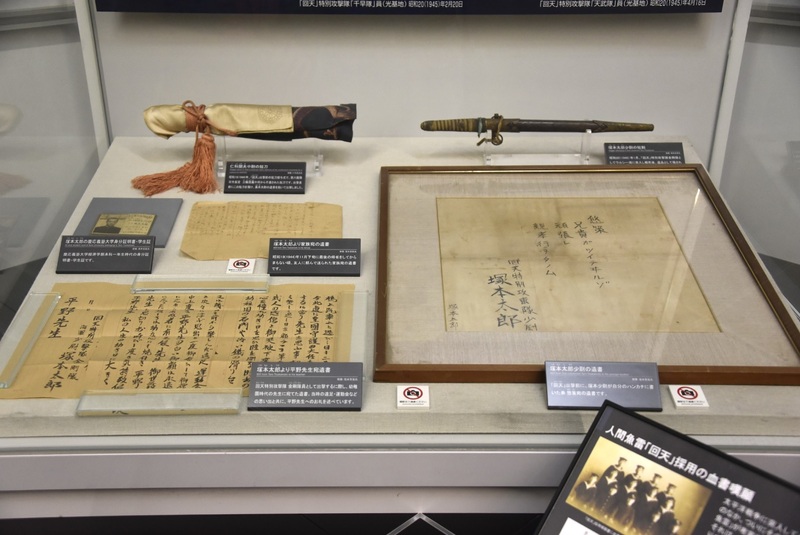 In 1889, the Meiji Constitution of Japan was promulgated and the Navy also had a major restructuring, after close to two decades of rapid growth from a coastal force to a respectable naval organization. Kure was designated the second of the four Naval Districts ( 鎮守府 Chinjufu ) of Japan. The other three were, in chronological order, Yokosuka ( 横須賀 ), Sasebo ( 佐世保 ) and Maizuru ( 舞鶴 ). By 1903, the Kure Naval Dockyard or Kure Arsenal had been established and would eventually evolve into Japan's biggest arsenal town. It was instrumental in propelling Japan to become a naval power in Asia. Some of the warships built in Kure included the aircraft carriers Akagi ( 赤城 ), Soryu ( 蒼龍 ), Unyo ( 雲鷹 ), Chuyo ( 冲鷹 ), Shinyo ( 神鷹 ), Katsuragi ( 葛城 ), seaplane carriers Chitose ( 千歳 ), Chiyoda ( 千代田 ), seaplane tender Nisshin ( 日進 ), battleships Yamato ( 大和 ), Nagato ( 長門 ), Fuso ( 扶桑 ), Aki ( 安芸 ), Settsu ( 摂津 ), battlecruisers Tsukuba ( 筑波 ), Ikoma ( 生駒 ), Ibuki ( 伊吹 ), heavy cruisers Nachi ( 那智 ), Atago ( 愛宕 ), Mogami ( 最上 ) and the seaplane carrying submarine I-400. It suffered heavy bombardment by the USAAF during the closing months of WWII but was largely spared the direct effects of the atomic bombing of Hiroshima as it was 26km away. After the War, Kure would evolve into a major ship building center and it still remains an important naval base for the JMSDF. It is also known as Yamato no Furusato ( 大和のふるさと ) which could be translated as " Hometown of the Yamato ". 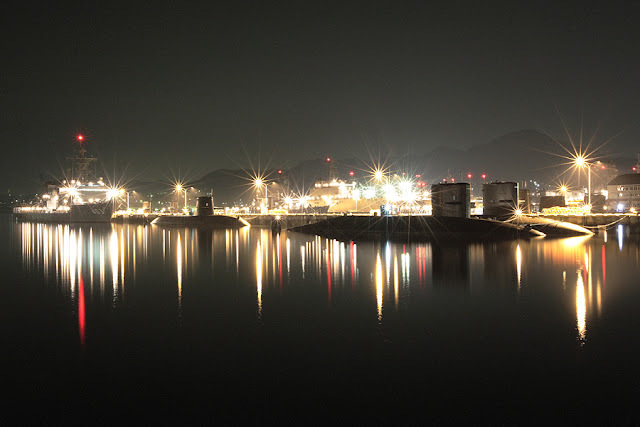 Modern day Kure is a major base for the Japan Maritime Self Defense Force. 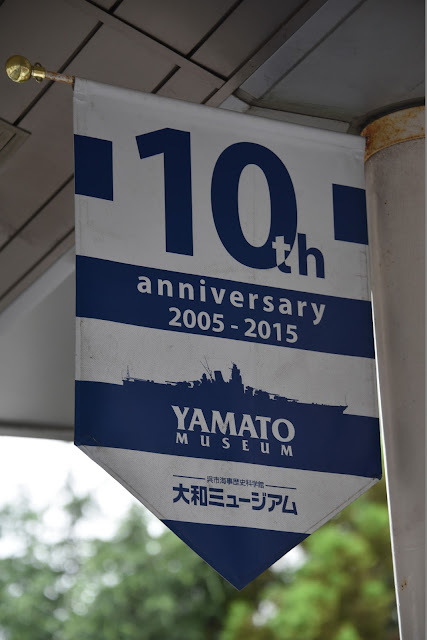 The Yamato Museum is located at Kure's wharf area right across the bay from the shipyards that built the battleship Yamato almost eighty years ago. 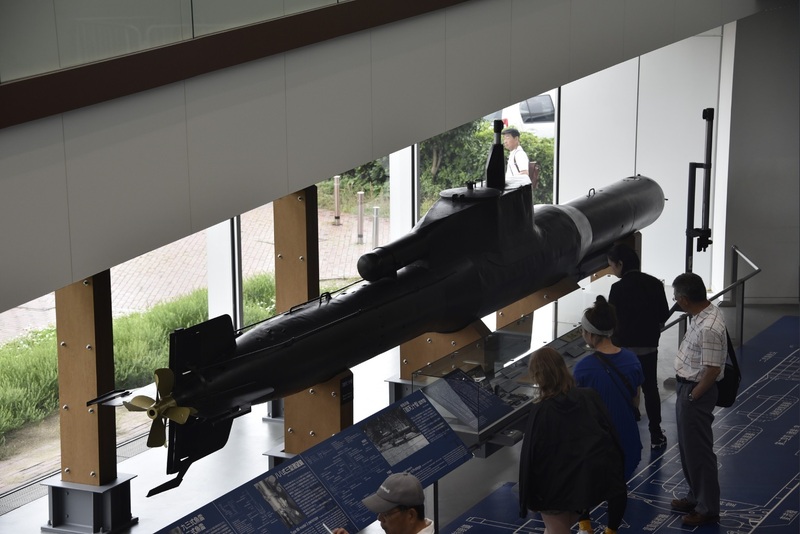 It is diagonally across the road from another major attraction of Kure, the JMSDF Kure Museum which specializes in undersea warfare, meaning submarines and anti-submarine warfare, mines and mine hunting. Assuming that you are arriving on foot like I did, as were the majority of the visitors, the first thing that you will notice even before reaching the main museum building is a larger than life statue of Neptune in his glorious birthday suite and holding a trident, standing proudly at the main square. This God of the Seas is generally much more muscular looking compared to his many other iterations elsewhere in European cities. in front of the Yamato Museum. Still outside the museum but adjacent to the main square and next to the motorway is a narrow strip of land, the outdoor exhibit area, with several large sized artifacts from the battleship Mutsu ( 陸奥 ). The main anchor, the aft jackstaff, the propeller, the rudder and even the 16.1 inch main gun ( 410mm ) from turret number 3 is displayed. The IJN Mutsu was a Nagato-class battleship that entered service with the Imperial Japanese Navy in 1921 and was sunk in 1943 after it suffered a mysterious internal explosion at the Hashirajima Anchoring Area at Hiroshima Bay. Large portions of the battleship was salvaged in later years after the War and the relics are displayed in various parts of Japan. 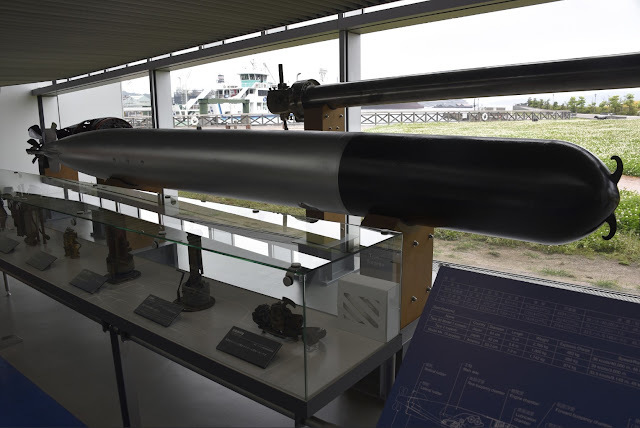 Although the Mutsu was constructed not at Kure but at the Yokosuka Naval Arsenal near Tokyo, it sunk in the waters within the Kure Naval District and its artifacts are still relevant for the Yamato Museum. 41cm ( 16 inch ) main gun from Mutsu's number 3 turret. The breech of the 41cm main gun of the Mutsu. 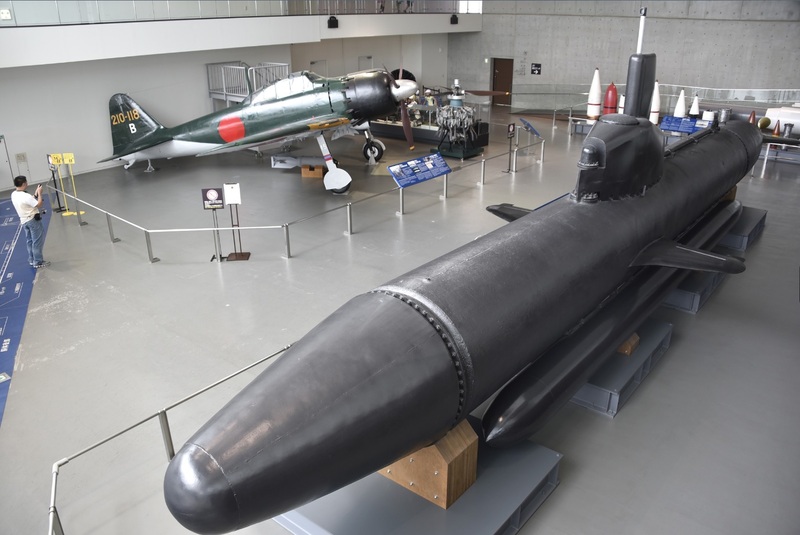 The Yamato Museum is housed in a four-storey building that is rather non-descript. Unlike the JMSDF museum across the road with its " Iron Whale " the decommissioned JDS Akishio diesel submarine as its main facade, the Yamato Museum has nothing externally to scream about. Inside the museum, the ticketing counter is located by the main entrance and it would set you back ¥500 ( US$5) for the admission ticket. The ticket itself is printed on art paper and would make a good book mark, if you have not gone the way of the e-book that is. Non-Japanese speaking visitors may obtain headsets that will provide translation of the exhibit write-ups free of charge. 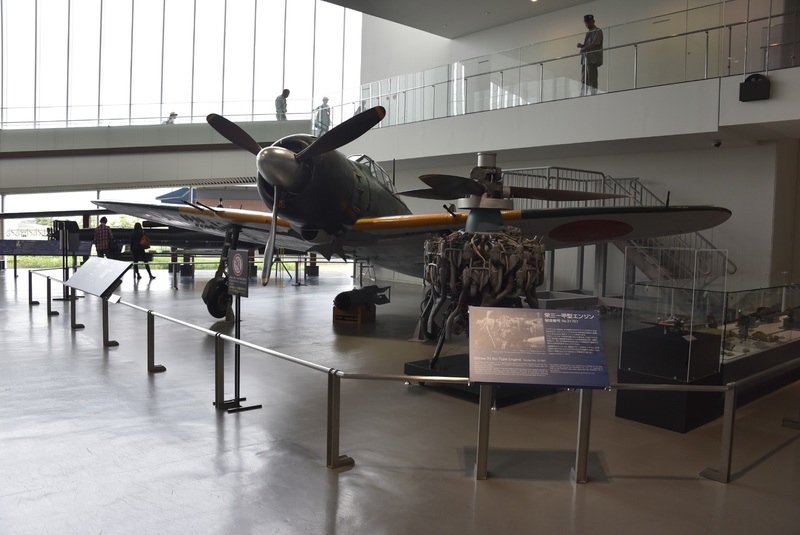 The first floor is where you will find the museum shop and the History of Kure exhibits. It includes a large section devoted to the battleship Yamato. At the centre of the building is the Yamato Hiroba ( Square ) where the 1 : 10 scale model of the Yamato is displayed, the main attraction of the museum. 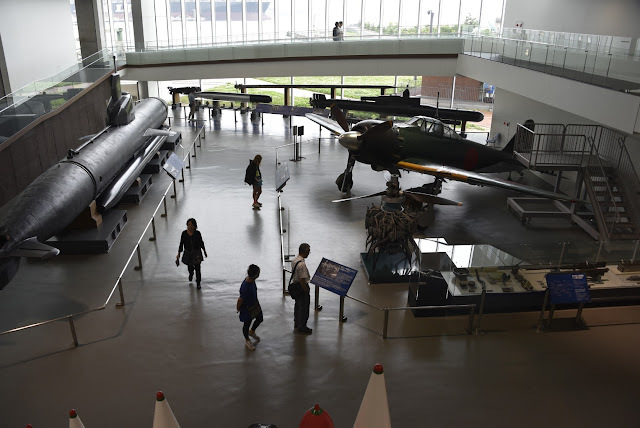 The Large Object Exhibition Room is also on this floor where a Zero fighter, a midget submarine and a Kaiten human torpedo is displayed. The second floor is mainly viewing decks and interconnecting passageway where some scale model of warships are on display while the third floor has a section on ship building technology and the Yamato theatre where movies and features are screened. The fourth floor is where the library is located and there is also a viewing terrace where visitors may view the shipyard and wharf around the museum. The first thing a visitor sees after entering the museum is the museum shop! 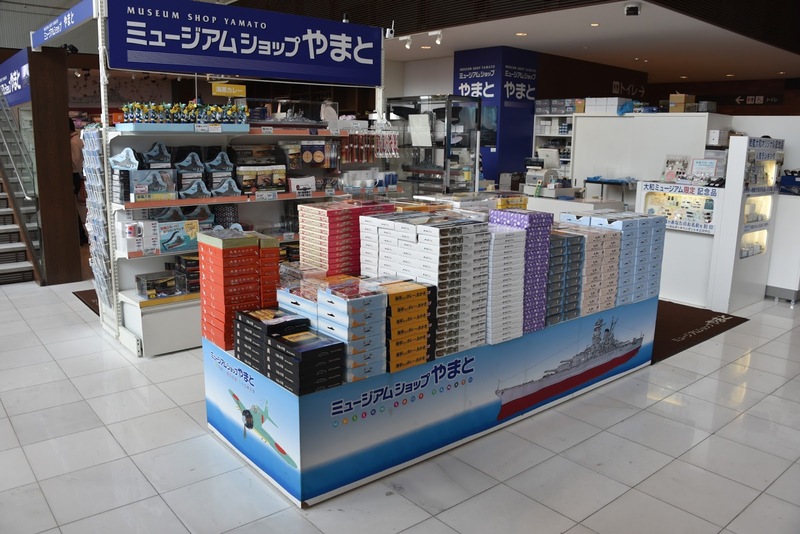 Stacks of naval and Yamato themed Japanese snacks on display. 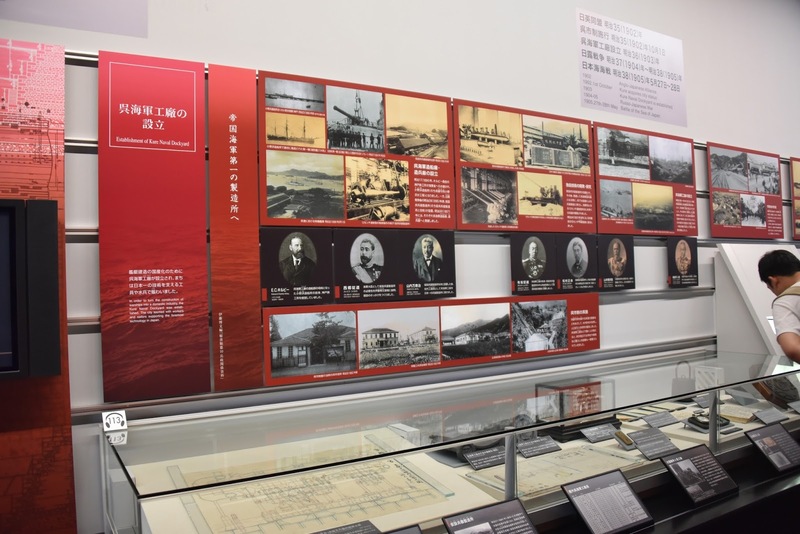 In this exhibit area are all the photographs and artifacts relating to the growth of Kure from a small seaside town in feudal Japan into one of the most important naval base and arsenal during WWII and its ultimate postwar adaptation to become a ship building hub. 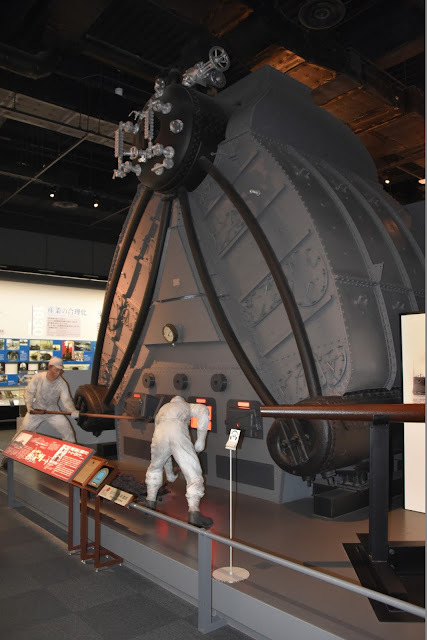 As you enter this section, a life-sized mockup of the coal-fired boiler of the battleship Kongo greets you, complete with the figures of two seamen shoveling coal! As you move along, the exhibits progress chronologically from the early years of the Kure Naval District ( 1889 ) to the formation of the Kure Arsenal ( 1903 ) and then to the post WWI economic depression of the twenties, the Washington Treaty of the thirties which limited the tonnage of capital ships that each major naval power was supposed not to exceed, the development of the ( naval ) aviation industry, Kure and the Pacific War ( WWII ), civilian hardships during the War and the firebombing raids of 1945, the atomic bombing of Hiroshima and the post war recovery and transition to civilian shipbuilding and finally the transformation of Kure into the modern port city of Japan that we see today. 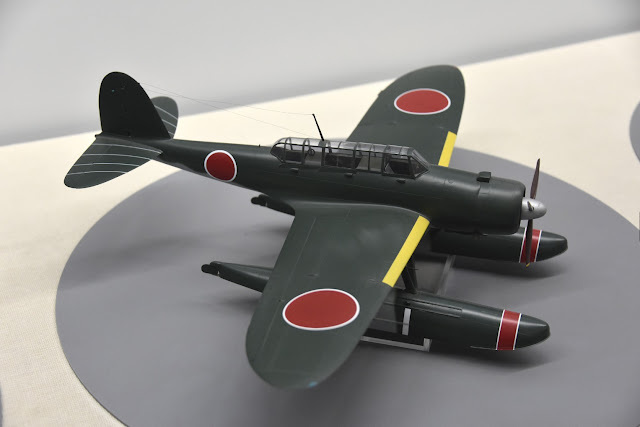 There are many scale models of WWII naval aircrafts, warships and submarines and personal items belonging to long deceased commanders of the Imperial Japanese Navy like ceremonial swords and name seals, uniforms, documents etc. 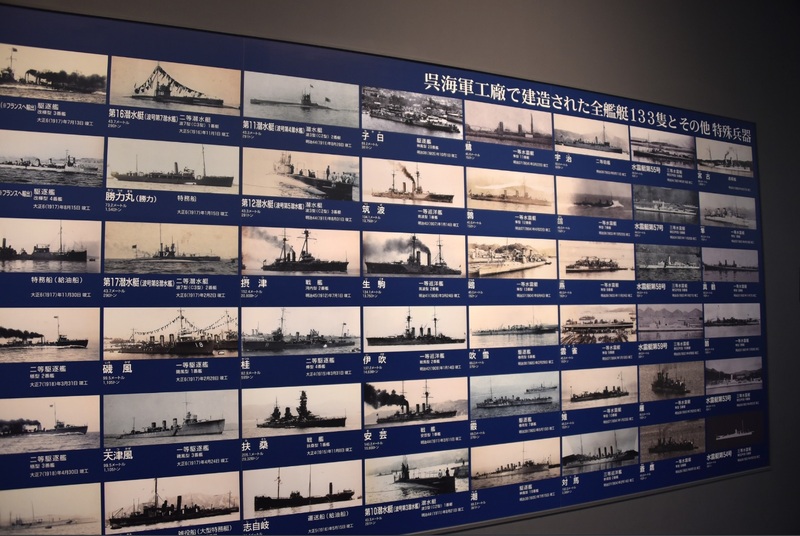 An entire wall had even been plastered with photograph after photograph of all the ships ever built at the Kure Arsenal among which the Yamato is the most famous. 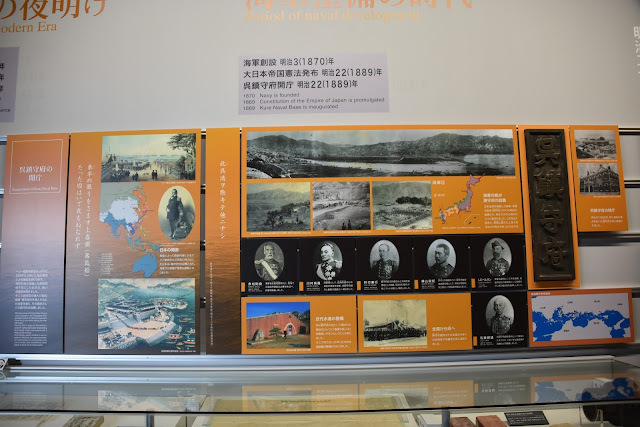 The museum curator made sure you would never leave this section without having at least some understanding of the significance of Kure in the history of the Japanese Navy. not surprising as IJN Kongo was built by the Vickers Shipbuilding Company. It was laid down at Burrow-In-Furness, in 1911.
the establishment of the Kure Naval District ( 1889 ). the industrialization of Kure at the turn of the 20th century. transformation of Japan into an East Asian Maritime Power. 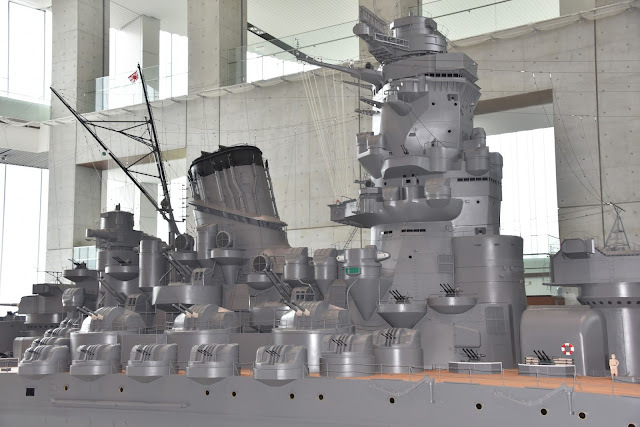 Beautifully constructed scale model of the battleship Kongo displayed in this section. the Type 6 ( modified Holland-class ). on 15th Apr 1910 with the loss of all hands. 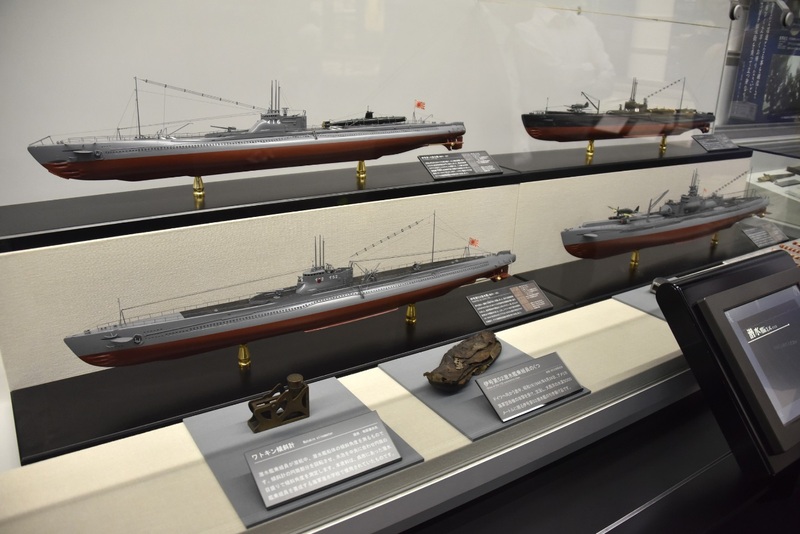 1:100 scale Japanese Navy submarine models. Note piggy-backed Kaiten human torpedo on I-16 ( top ). A Watkin Clinometer and a submariner's old shoe from I-52 is also displayed! 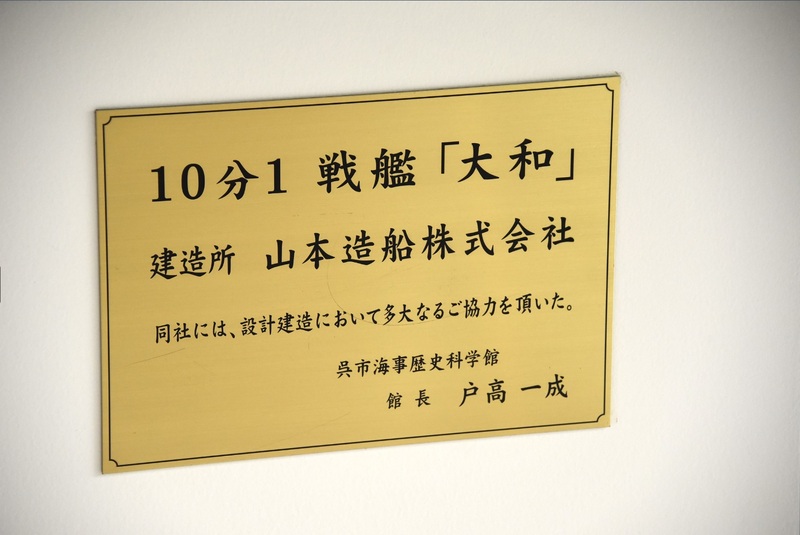 A section on the naval aviation factory in Kure. Close-up of the 1:24 scale Zero reconnaissance seaplane. are listed here, most with accompanying photographs. 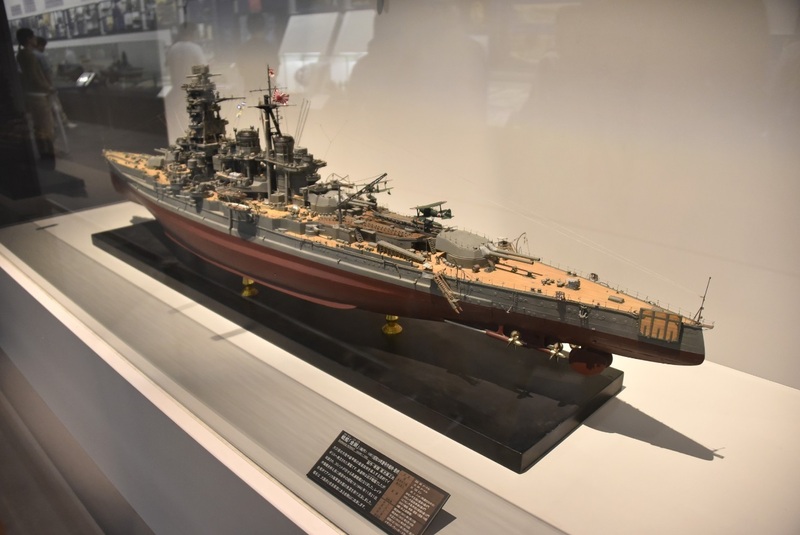 This subsection of the History of Kure Exhibit gives a detailed history of the battleship Yamato, the then cutting edge technology that was applied in the design and construction of such a humongous warship and its operational history throughout WWII. 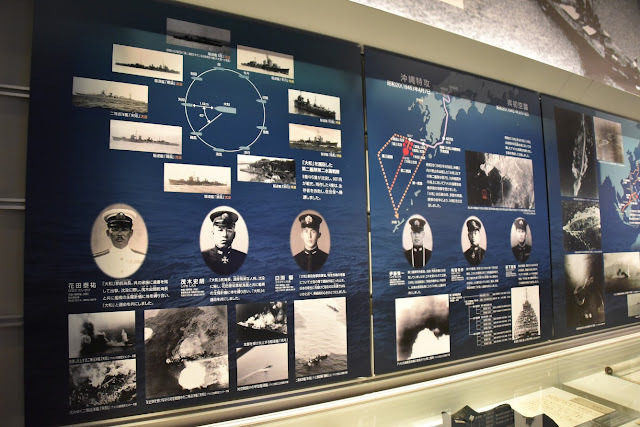 The focus was on the Yamato's last mission to Okinawa in the spring of 1945, the oneway suicide mission known as Operation Ten-Go to fight the American invasion fleet and defend the last of the Japanese territories before the Home Islands. 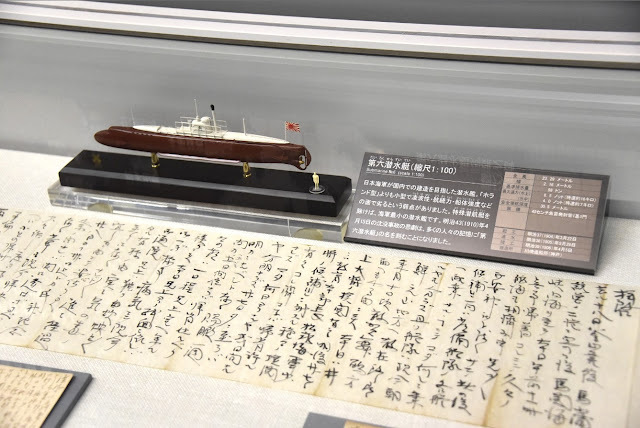 On display are letters, postcards and even the wills of the Yamato's sailors who knew that they were unlikely to survive the coming battle. The names of the entire crew of the Yamato as it headed for its last mission, many of which perished when the Yamato was sunk, is displayed prominently on the wall. construction of the Yamato explained. on 30th Oct 1941. Wikipaedia. Operation Ten-go : The last mission of the Yamato. way short of her original destination of Okinawa. 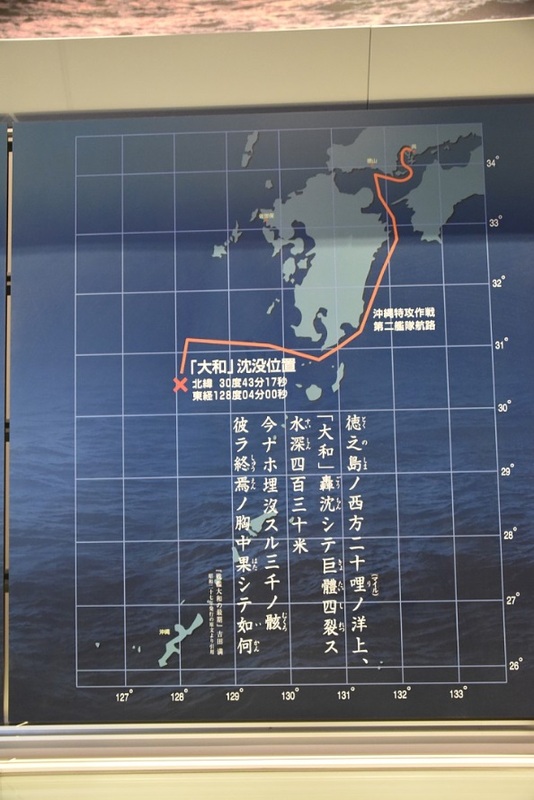 This subsection is dedicated to the discovery of the wreck of the Yamato which lies on the seabed 430m beneath the surface some 290km south of Kyushu Island. Many photographs are on display showing the battleship broken into many pieces scattered on the seabed. Some salvaged artifacts are also on display, like corroded 25mm anti-aircraft cartridges, glass bottles, boots and other everyday items of that era. 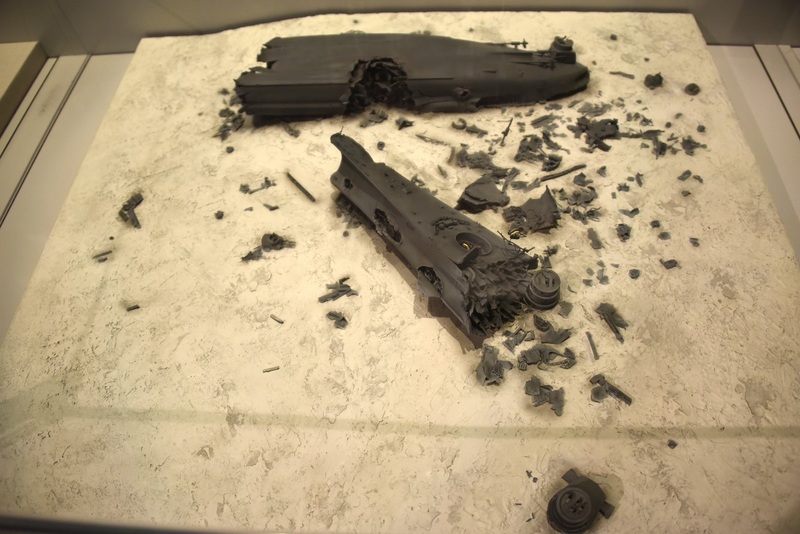 A diorama of part of the Yamato wreak is also displayed, showing how the toppled 18.1 inch gun turret was resting on the bottom of the sea. A 9 min clip of the latest survey to the wreckage in May 2015 using digital technology is being screened at the Yamato Theatre on the 3rd floor. 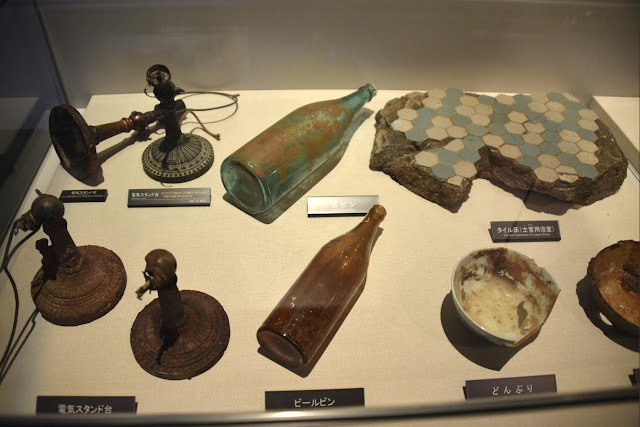 beer bottles, tiles from the officer's heads, donburi ( rice bowl ). More artifacts : Bugle, Seawater Hose Nozzle and Battery. and the ripped out turrets. Photos from previous underwater survey of the Yamato wreck. At the centre of the museum is its main attraction, the 1:10 scale model of the battleship Yamato. It is constructed by the Yamamoto Shipyard Company ( 山本造船株式会社 Yamamoto Zosen Kabushikigaisha ) of Kure, as proundly proclaimed by an inscribed metal plate attached to the pedestal. Since the actual battleship measured 263m in length, the scale model is exactly 26.3m long. It is HUGE. Simply the biggest model ship that I've ever seen and will likely ever see. The first warship model that I had as a child was the 1:426 scale Revell classic, the USS Arizona. That was subsequently followed by the Hasegawa and Tamiya 1:700 Waterline series, USS Enterprise, IJN Junyo, Mogami ... all nothing compared to this monster. You can see for yourselves how this model was constructed back in 2003 here. 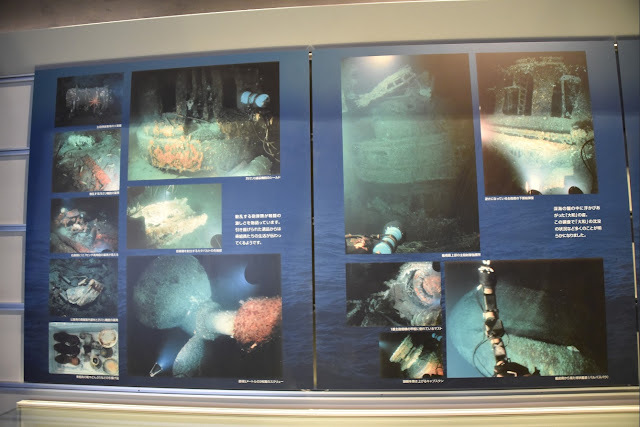 It was constructed based on whatever information was available of the Yamato and photographs and data collected during the 1999 diving expedition to the wreck of the Yamato. The Japanese had deliberately destroyed the plans and any documents and photographs of the Yamato at the end of World War II and not much reference material was available for such a reconstruction. 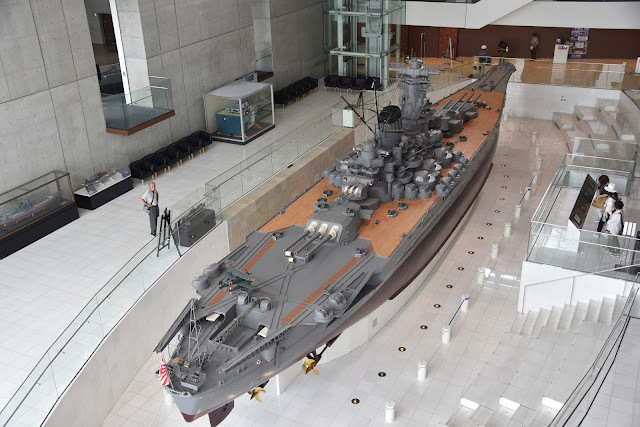 The giant model ship occupies a recessed area in the middle of the museum building called the Yamato Hiroba ( Yamato Square ), sitting on top of a pedestal of sorts. Museum visitors can only view it from afar and will not be able to touch it. Every detail is taken care of and as accurately represented as possible, above and below the waterline. Even the seaplane is included. 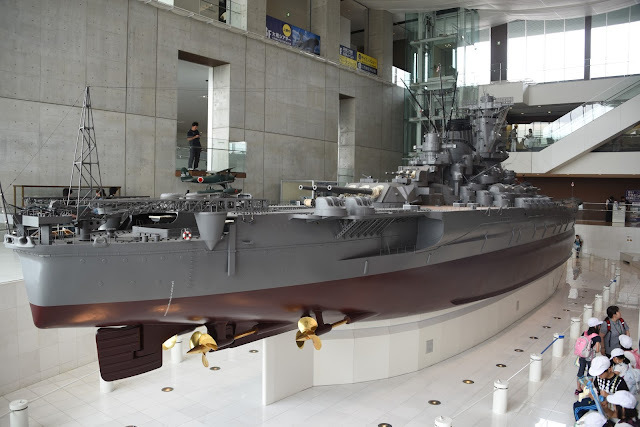 1:10 scale Battleship Yamato. Builder : Yamamoto Shipyard Company Limited. the main hall of the museum. The superstructure and the anti-aircraft guns. Note the human figure on the right. 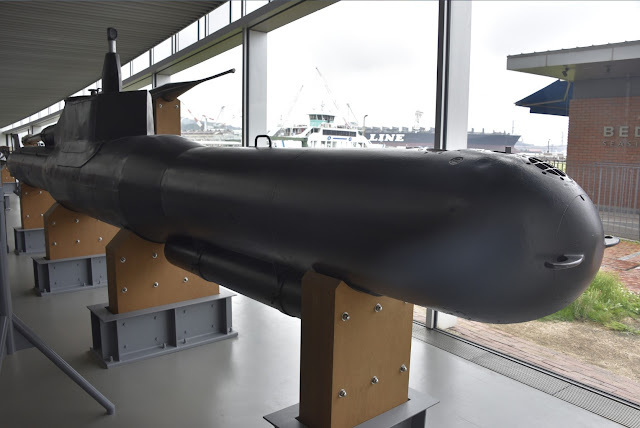 The Yamato model viewed from level 3 of the museum. This is the other interesting area of the museum, a large open space with high ceiling and an array of WWII relics like a Mitsubishi A6M7 Type 62 Zero Fighter, complete with engines and 13mm machine guns. 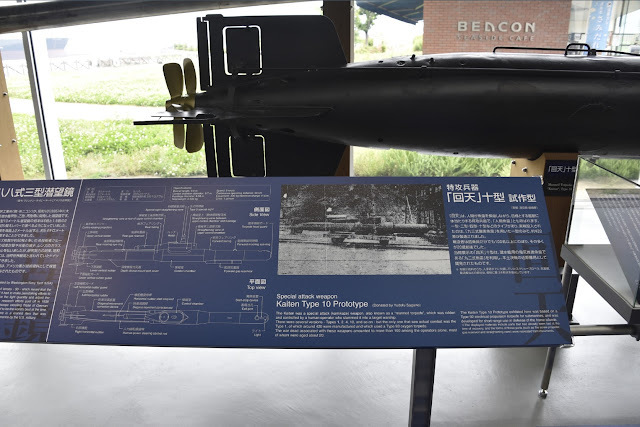 Also on display are the Type 93 torpedo, a prototype of the Kaiten Type 10 suicide submarine, a late model Kairyu ( Sea Dragon ) midget submarine with hydroplanes that enabled it to be controlled like an airplane and shells of various types and caliber ( 18 inch and 16 inch ) from the Yamato and the Mutsu. The Kaitens are suicide submarines piloted by a single officer. The word kaiten ( 回天 ) itself means " return to heaven ". These special mission attack crafts were the result of Japan's desperate attempt to turn the tide of the war during the last two years of the Pacific War. A total of 6 models were developed, Types 1,2,4,5,6 and 10. Early models were modified from the very large Type 93 ( aka Long Lance ) torpedoes. Only the Type 10 displayed at the Yamato Museum was derived from the Type 92 torpedo and only the Type 1 actually saw combat. The general layout of the Large Objects Exhibition Room. 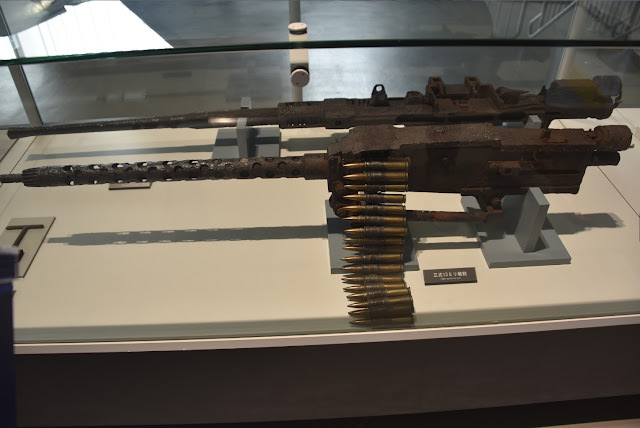 Special Attack Weapon : Kaiten Type 10 Prototype. This is a human torpedo kamikaze submarine. 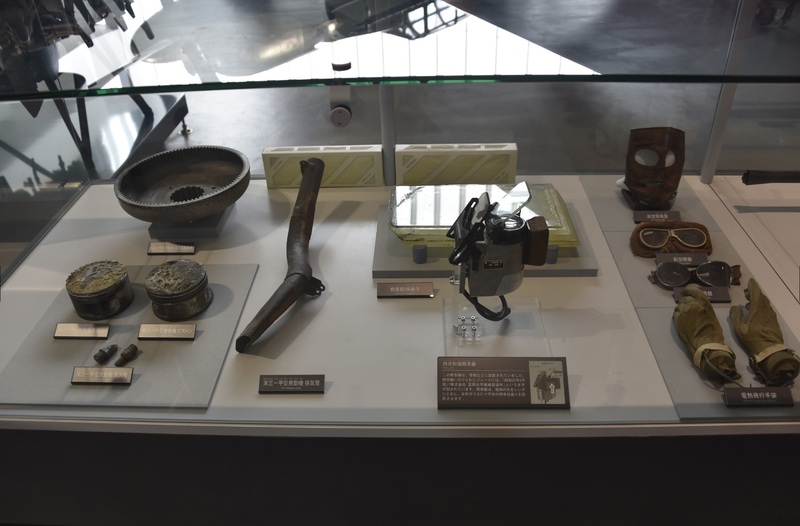 The propellers of the Kaiten Type 10 and the write-up. The relative size of the Kaiten Type 10 can be gauged from this photo. Ceremonial short sword of a Kaiten operator and his written will. The Type 93 torpedo on display adjacent to the Kaiten. 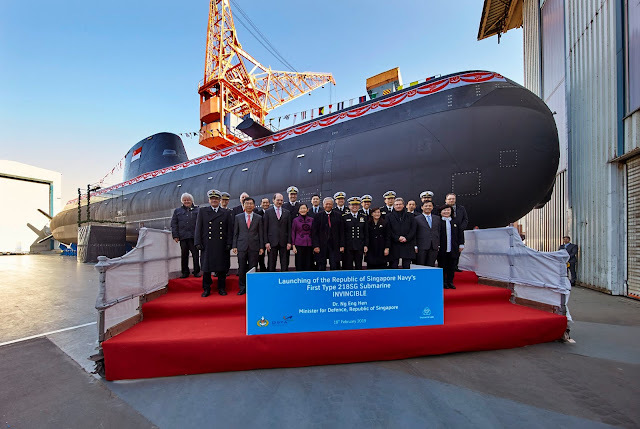 Mass production type Kairyu special attack midget submarine. Kairyu ( 海龍 ) means sea dragon. The Kairyu has hydroplanes that allowed it to be controlled like an aircraft. 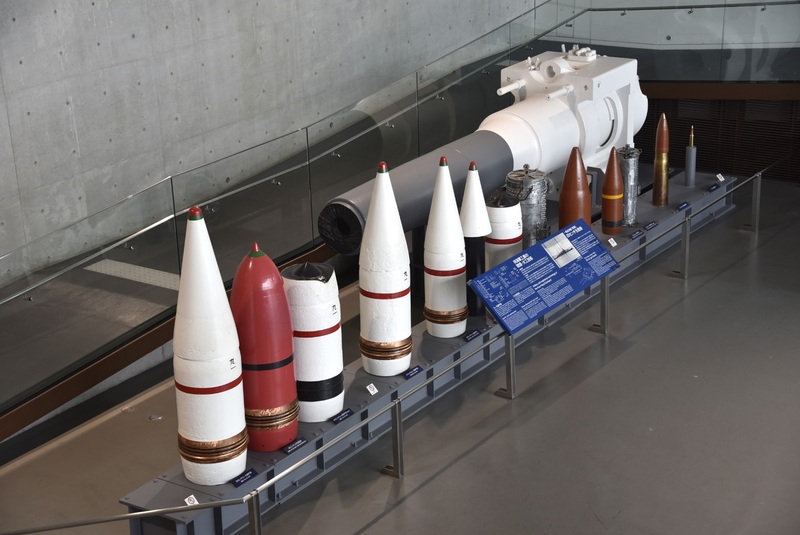 16 and 18 inch shells of various types on display. Also a cutaway gun barrel showing the thickness of the steel used in its construction. The Zero Type 62 fighter with a 250kg bomb. The Zero's Sakae 31 Ko-Type engine is also displayed. the Zero Fighter's 13mm machineguns. The gun sight of the Zero, engine parts and pilot's accessories. This 3rd floor area looks more like a science museum than a history museum. 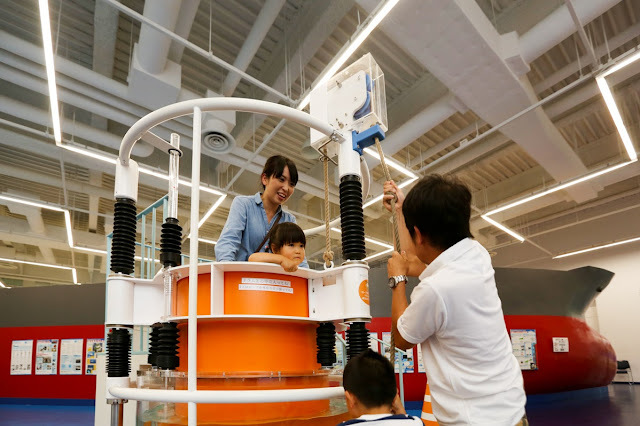 It has all the hands on setups that will appeal most to young children, all to do with the principles of ship building and the technology of navigating the high seas. You can learn about the most fundamental science behind what makes ships float on water or try peeping through a working periscope that looks out to the busy bay next to the museum. What I liked was the ship simulator with three large monitors where you can play captain and try to pilot your ship from the port out to the bay, not with the mouse and keyboard but with throttle and wheel. It was not as simple as it seemed, and collision avoidance was very much part of the game. Its free and you can try it as many times as you wished. Ship Simulator. Source : Kure Maritime Museum. 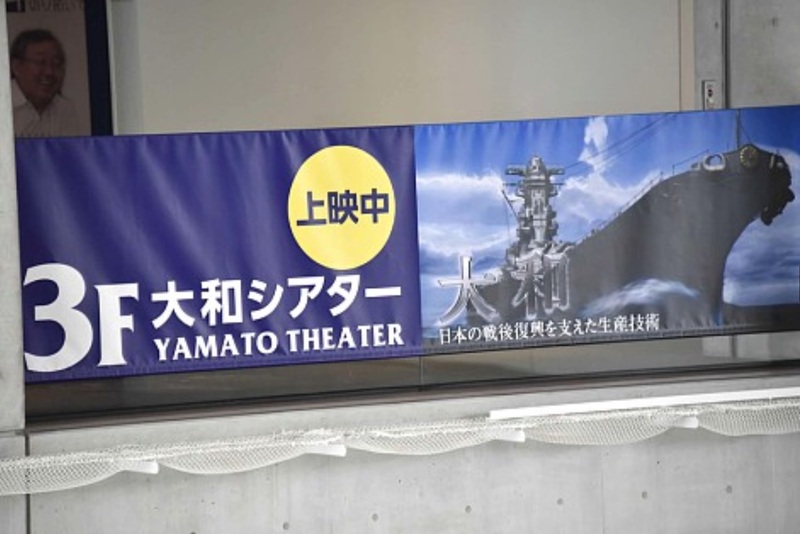 This 3rd floor area is where the mini theatre is located and also where materiel related to the Japanese science fiction anime Space Battleship Yamato is displayed. In case you are not aware, this film was released back in 1974 and has since spawned numerous sequels. The story had it that in the year 2199 Earth was bombarded with radioactive meteorites by an alien race and was left barren with even the oceans evaporated. Humans retreated underground but faced extinction within a year. They obtained blueprints for a faster-than-light engine from a message capsule found in a mysterious spaceship which crashed on Mars, technology of another superior alien race from the Large Magellanic Cloud. 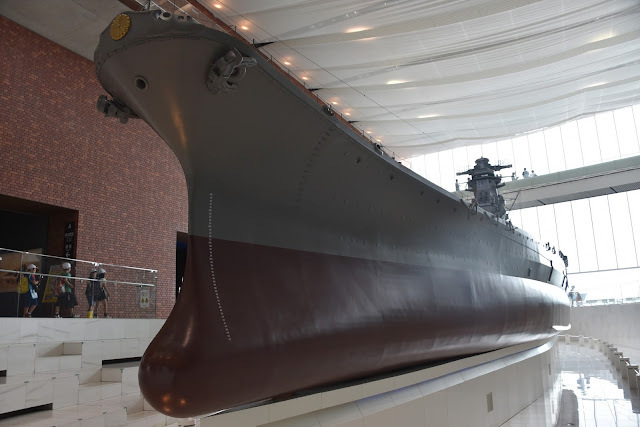 They built the space warp drive ( Wave Motion Engine ) inside the ancient hull of the sunken but now exposed and partially buried battleship Yamato to hide it from the orbiting aliens and also installed an incredibly powerful Wave Motion Gun at the bow. Their mission was to go to the LMC, 170000 light years away, and obtain a device than would clean Earth of its radiation ..... . It has been released as Star Blazers in the US. Its creator, Leiji Matsumoto, is now an honorary director of the museum. 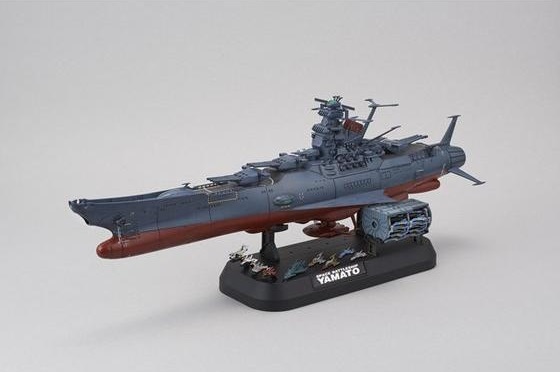 1/1000 scale plastic model of the Space Battleship Yamato 2199. Source Bandai. There is a library on the 4th floor where you can find all sorts of reading material on Kure and the Yamato, books, maps, photos etc. There is also a rooftop viewing terrace where you can enjoy a panoramic view of Kure Port and its surrounding shipbuilding facilities and wharves. 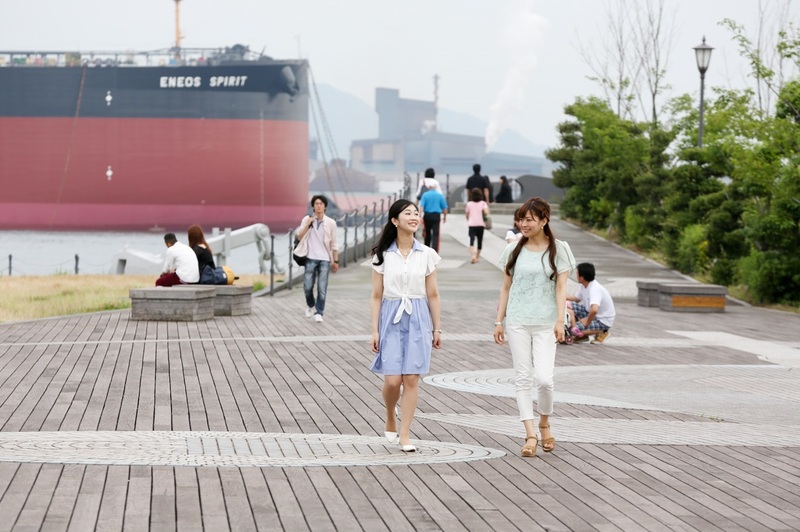 A park along the waterfront area behind the museum where you can view passing ships is shaped like the upper deck of the Yamato. Don't forget to check out the Museum Shop at the entrance before you leave. 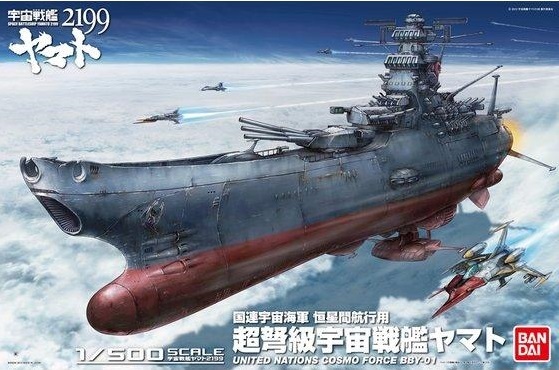 You will find scale model kits of the Yamato from various brands, some are limited edition and 1:350 scale premium kits. which represents the bow. See image below. 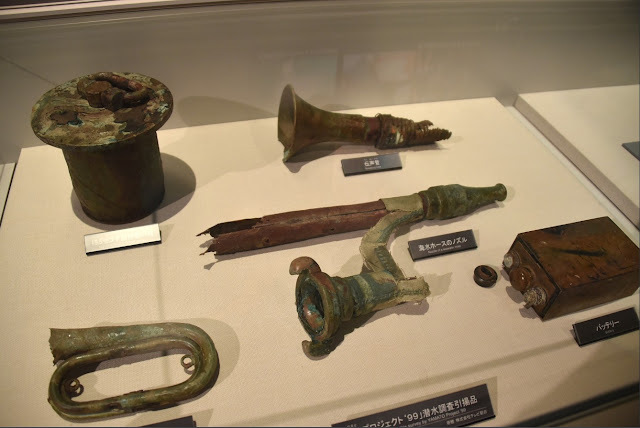 Source : Kure maritime Museum. port side forecastle complete with the A and B turrets. Let us be honest. The Kure Maritime Museum is more about the naval history of Kure and especially of the Imperial Japanese Navy battleship Yamato than it is about the shipbuilding industry of Kure. It is nothing but a naval museum, despite its formal name suggesting otherwise. It is much better known as the Yamato Museum, locally in Japan as well as internationally and among the foreign visitors to Japan. 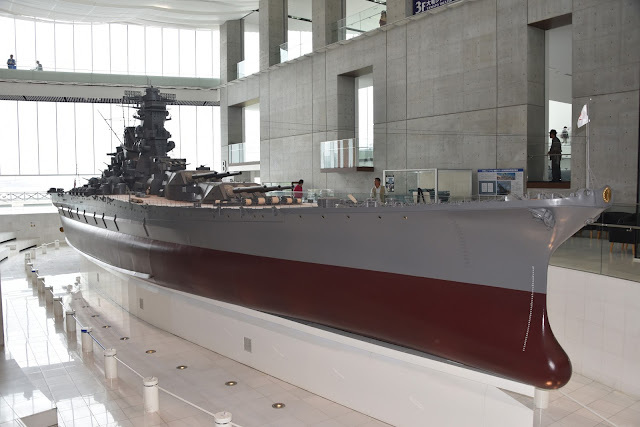 In fact with so much of the exhibits focusing on the Yamato, the museum might as well just call itself the Yamato Museum of Kure from now on. 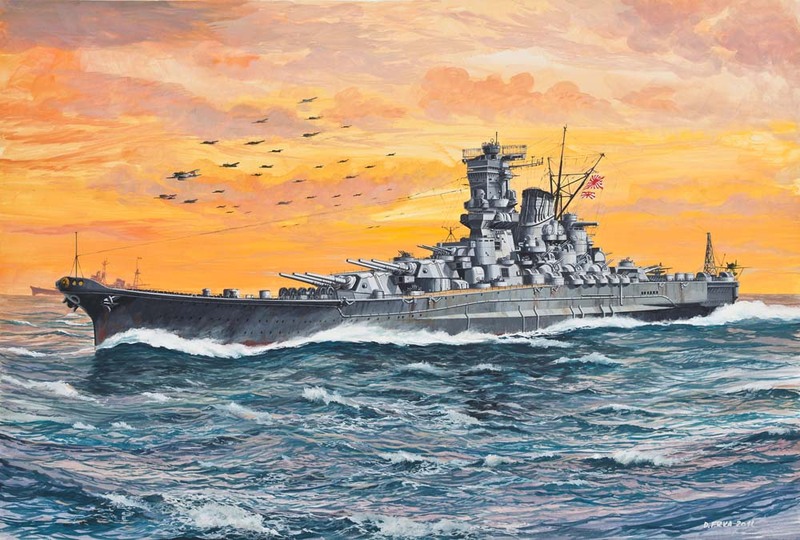 The Yamato was a war machine operated by a brutal military regime that had been defeated many years ago. It has been resting peacefully on the ocean floor for the past seventy one years, going nowhere, certainly not to the Large Magellanic Cloud. It is now a cold, dark and watery war grave. 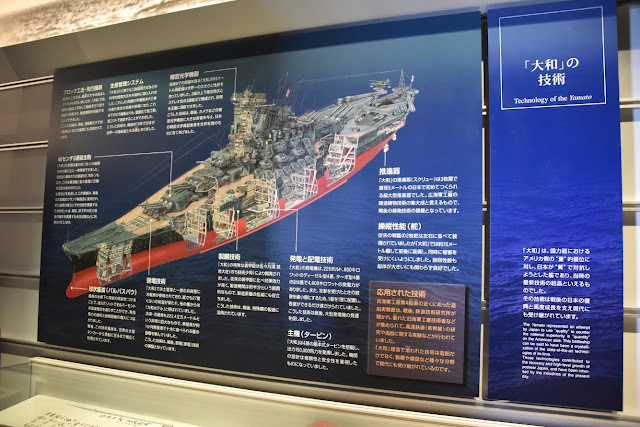 The Yamato Museum does a good job in enabling the younger generation to understand the brutality of the War and to marvel at the advance technology that went into the construction of the world's biggest battleship, ever. The era of the battleship is long over and there will never be another ship like the Yamato or its sister ship the Musashi. 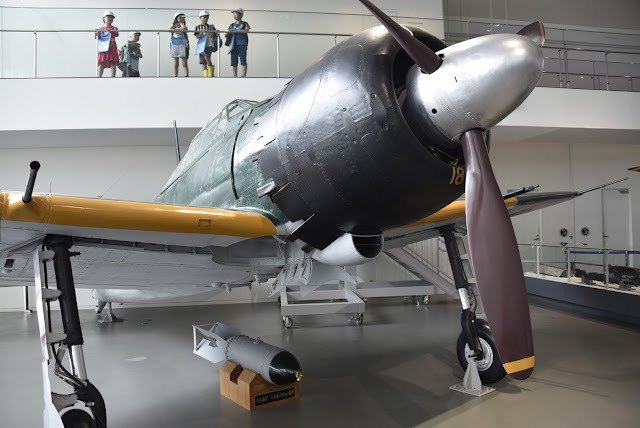 Like the Mitsubishi Zero Fighter, this is one of the few things that the Japanese can still be proud of and it continues to live in their hearts and minds. This one of a kind naval museum is highly recommended especially for fans of WWII and naval history and definitely worth a visit if you happened to be in Hiroshima. 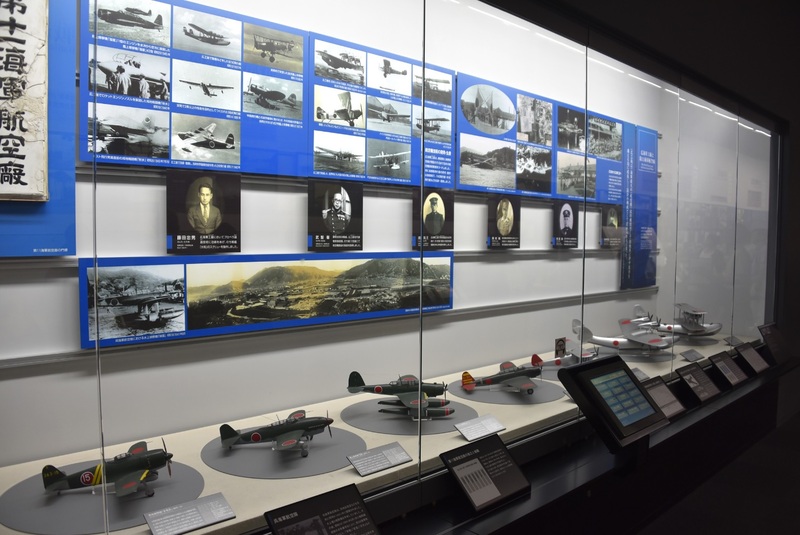 After the Yamato Museum, walk across the road and hop over to the adjacent Japan Maritime Self-Defense Force Kure Museum. 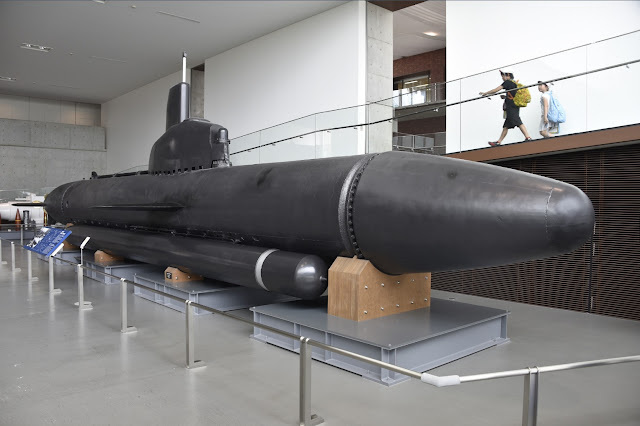 It cannot be missed with its huge albacore-hulled submarine at its front. It is just as unique and even better - less crowded and with free admission! That will have to be covered in another article though. 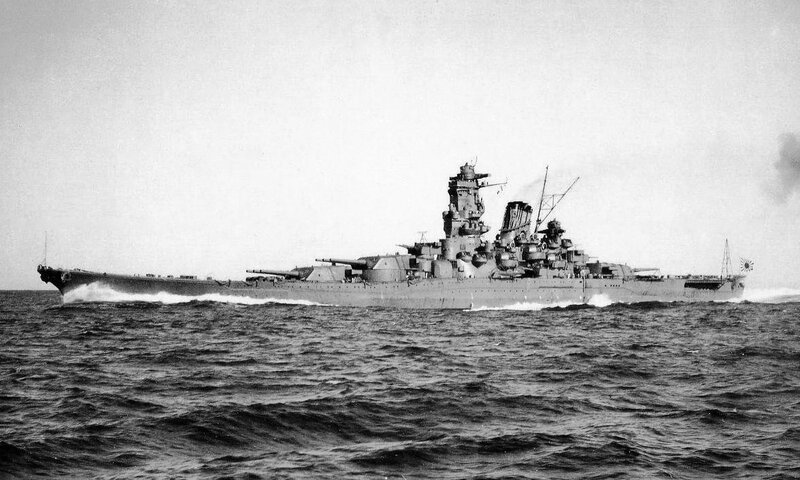 CGI of the Imperial Japanese Navy Battleship Yamato as it appeared in 1945.